Hi, I am interested in your 1956 Chevrolet Bel Air (stock #5050-CHA) listed on Autotrader for $79,995. I'd like to get more information about this vehicle and confirm its availability. 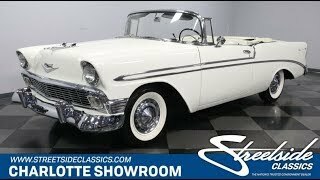 We all love a desirable classic like a 1956 Chevrolet Bel Air convertible. But when your exceptional paperwork can prove that its the original V8 under the hood, and the outstanding color combo is correct, then you know why they invested so much in restoring this true icon. This one just looks like it was built to lead the parade. After all, theres just something purely premium about a 50s classic finished in nothing but bright white and brighter chrome. The factory-correct India Ivory has been given quality respray during this cars restoration so that it knows how to radiate in the sunshine. Not only is the full car covered in white, but also with the white convertible top and wide whitewall tires, this has a terrifically coordinated snowy appearance. The reason why a Tri-Five Bel Air is the icon of the American road is all the brightwork. The form-fitting chrome bumpers, full-width grille, complete windshield trim, factory wheel covers, and jet age hood ornament have all been given the proper care to make sure this looks like rolling history. Plus, the full-length sweeping side trim was exclusive only to the 56 Bel Air. So its not only key to get this artful arrangement complete and correct, but when its done this nicely, it also highlights the straightness of the sheetmetal. With the flip of a switch, the white convertible top powers down smoothly to reveal an impressive interior. You retain more of that great white look to coordinate with the exterior, and now its also joined by black carpeting, a black dash, black trim, and charcoal cloth inserts on the seats. The result is as eye appealing as a tuxedo. Plus, its exceptionally practical (after all, dark inserts in the doors and seats means youre not constantly worried about the dust on other passengers clothes and shoes.) The whole setup looks authentic, right down to the button-top pattern on the seatbacks. Slipping behind the wheel feels like slipping back in time thanks to the Bel Airs stylized steering wheel, classic dual cowl dash w/crisply bright trim, and even the AM radio is still cranking out tunes. So you can tell they took the time to get it right on this special Bel Air. The engine bay looks highly authentic, and for a very good reason. Because there was no numbers-matching system back then, most people feel lucky to just say their 56 Chevy has a period-correct small block. But this one is different. It has the original dealer invoice stipulating that youre looking at the 265 cubic-inch V8 that this was born with 63 years ago. So with this kind of proven rarity, they have taken the time to make it look correct right down to details like the red block, factory breather, and even a generator. And the way it fires up readily tells you they invested in this one for more than just its looks. As you look further in the invoice, it proves it was born to be powerful with the Power Pack four-barrel carburetor on top. Plus, with the correct Powerglide automatic transmission and power steering, this special droptop is easy to show off everywhere. Not only does the sale come with the important dealer invoice, but also you get the original warranty card, owners manual, maintenance records, and service manuals. This is a cut-above Bel Air that has been treated with the respect something this distinctly rare deserves. Call now!